Your satisfaction is our number one priority. Please use the contact us for support inquiries. The Federal Reserve Bank Financial Data Service is a concise and readily usable form of the Statistics, Historical Data, Surveys, and Reports published in flat file format by the U.S. Federal Reserve Bank. The Federal Reserve Bank Financial Data Service provides data search and retrieval across the full set of over 100,000 “SERIES” reports and over 8.7 million data points. Such comprehensive functionality like this is not provided by the Federal Reserve Bank. The hierarchy of the data has four levels.Statistical Release: Major divisions of financial and ecomomic information. 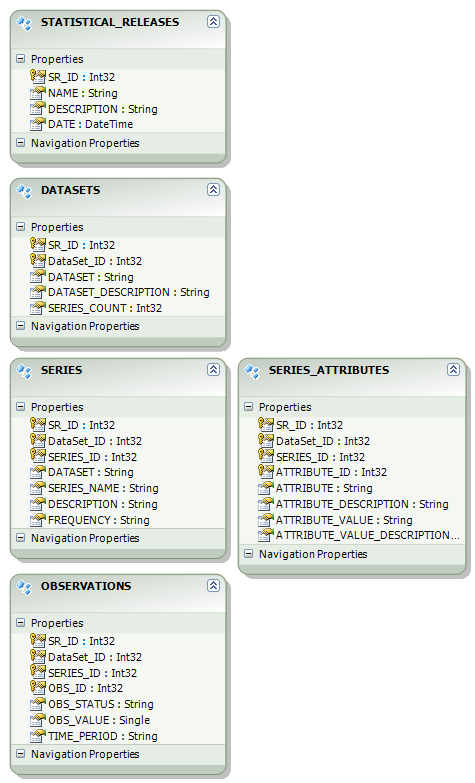 | Data Sets: A grouping category wherein each Series uses the same attributes set. | Series: Equivalent to a “Report”, each with a unique set of values applied to the attributes. | Observations: “The Data” for a particular SERIES. Except for Series, there is only one OData Entity for each level. Due to the varying attribute sets among Series, the lookup table SERIES_ATTRIBUTES provides attribute details for a particular Series. The intended user interface is a drill down through the hierarchy to identify the key set SR_ID, DataSet_ID, & SERIES_ID to then query OBSERVATIONS for all observation rows for a SERIES. Users should be able to retrieve a unique record at any level in the hierarchy by also specifiying optional parameters for that entity. All result sets returned to the user should include all entity properties (columns). Columns Returned . . .
Use . . . Primary purpose is to identify “SR_ID” for drilldown to DATASETS. Second level, “label” for grouping SERIES having the same SERIES_ATTRIBUTES. Use . . . Primary purpose is to identify “SR_ID” and “DataSet_ID” for drilldown to SERIES. Take note of the SERIES_COUNT column. Third Level, lists details, e.g. SERIES_NAME, DESCRIPTION, etc. FREQUENCY . . . data observation frequency, e.g. daily, monthly, etc. Use . . . Primary purpose is to identify “SR_ID”, “DataSet_ID”, AND “SERIES_ID” for drilldown to OBSERVATIONS(the data). Fourth Level, lists the actual data. Use . . . pulls the actual data for a SERIES. Third Level, lookup “Helper” table with SERIES specific attributes/value pairs.lists details, e.g. SERIES_NAME, DESCRIPTION, etc. Use . . . Primary purpose is to identify a SERIES’ attributes, e.g. Series Name, Currency, Frequency code list, Loan type, etc. Copyright © 2011-2017, MacroTrenz Corp., All rights reserved. Your satisfaction is our number one priority. Please contact us for support inquiries. The U.S Bank Financial Condition and Performance Data Service publishes, in a concise and readily usable data format, the regulatory reports, financial data, and structural information for FDIC-insured bank and thrift institutions published by the Federal Financial Institutions Examinations Council (FFIEC). The earliest data provided is from March 31, 2001. The U.S Bank Financial Condition and Performance Data Service provides data search and retrieval across the full set of over 350,000 quarterly Bank Call and Uniform Bank Performance reports representing over one billion data points. In addition, individual MDR element data can be retrieved across banks and reporting periods. Use . . . Returns a list of all quarterly reporting period identifiers in the format YYYYMMDD. “PERIOD_ID”, int, required . . . reporting period in the format YYYYMMDD. Use . . . identify individual bank/branch information and address(es) . Use . . . returns the full CALL REPORT, in a concise and readily usable data format, for the specified bank and reporting period. Use . . . returns the full UBPR REPORT, in a concise and readily usable data format, for the specified bank and reporting period. Query Keys . . . NOTE: while each query key is optional, at least one must must be specified to get results. “PERIOD_ID”, int, optional . . . reporting period in the format YYYYMMDD. “ELEMENT_NAME”, string(8 characters max, alphanumeric only), optional. Use . . . returns raw data in a concise and readily usable format.